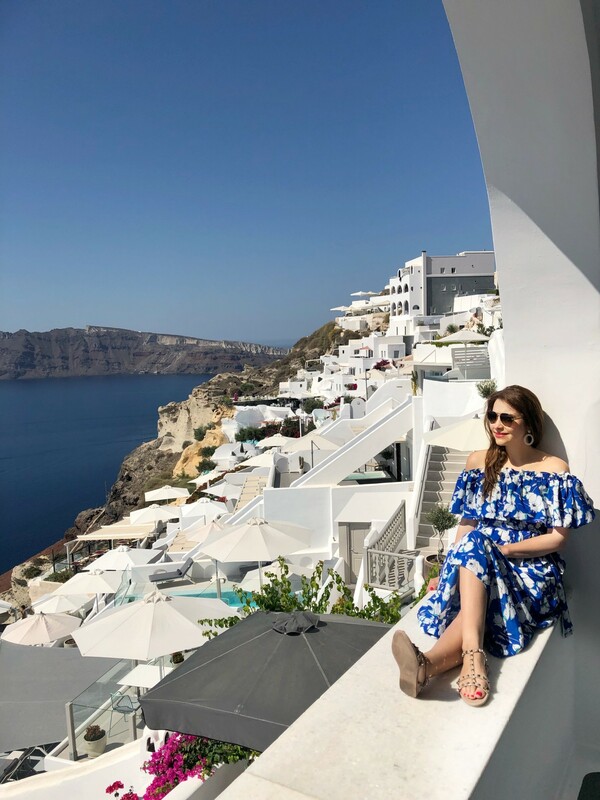 Traveling to Santorini had been on my bucket list for quite some time and when we finally booked our September trip to Greece, I absolutely could not wait to experience it. Located around 145 miles from Athens, Santorini is one of 220 islands that make up the Cyclades. Originally a volcano, the island and its surroundings are comprised of what’s left of the caldera. 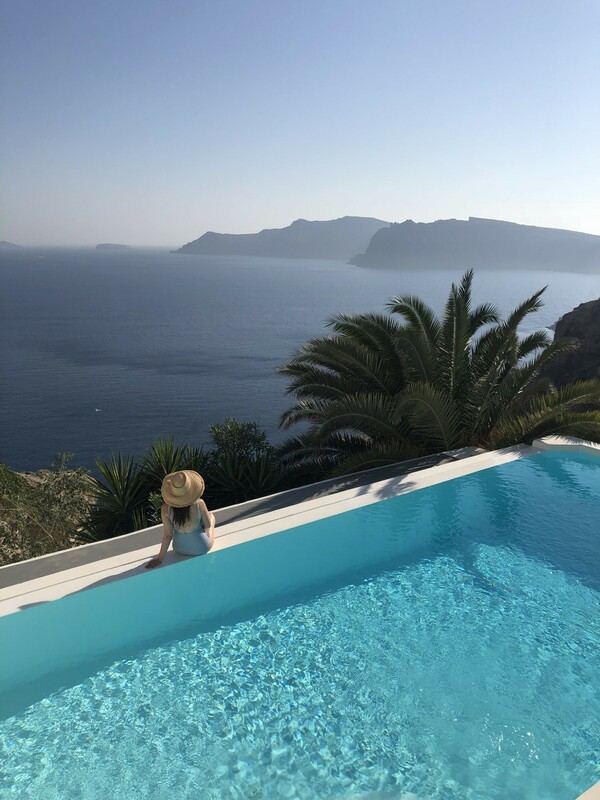 We stayed at Villa Katikies, located in Oia but tucked away from the main hustle and bustle. This property was attractive to us, because it features only 7 villas, each with its own open-air jetted tub, so it’s very peaceful and never feels crowded. Additionally, guests of Villa Katikies have full access to the larger Katikies Hotel, which is located a short walk away and offers multiple swimming pools, a champagne bar, and a Turkish restaurant. We loved taking advantage of the various amenities at each property and of course, enjoyed the stunning views! 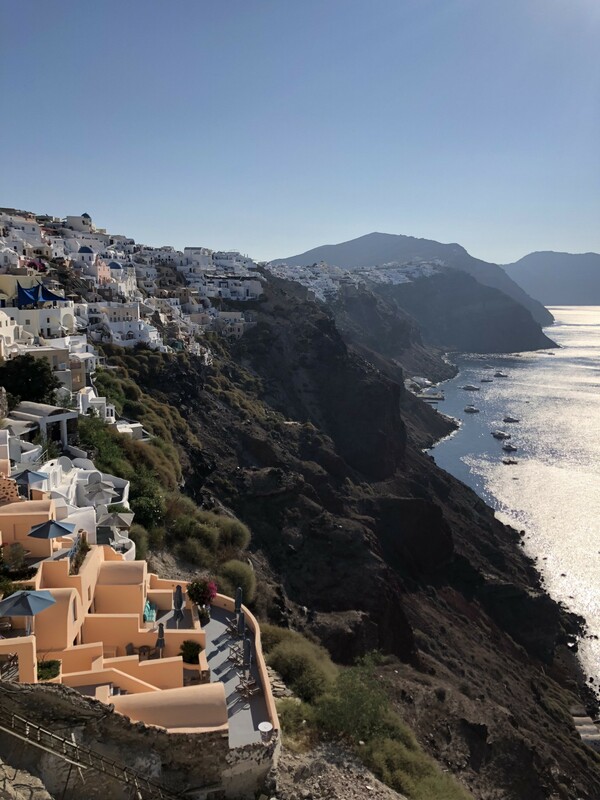 From all of Oia, the views of the caldera are absolutely breathtaking and pictures do it no justice. 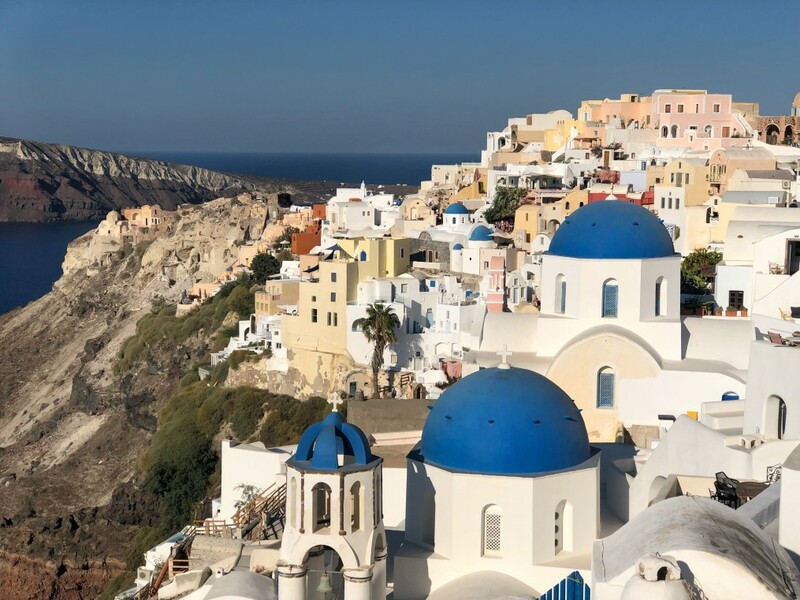 The town is situated in a way that allows you to enjoy both the picturesque landscape of Oia’s striking white hillside village, but also miles of blue water and untouched caldera. Oia, and Santorini as a whole, is incredibly photogenic, and I basically experienced sensory overload during our first walk through town. 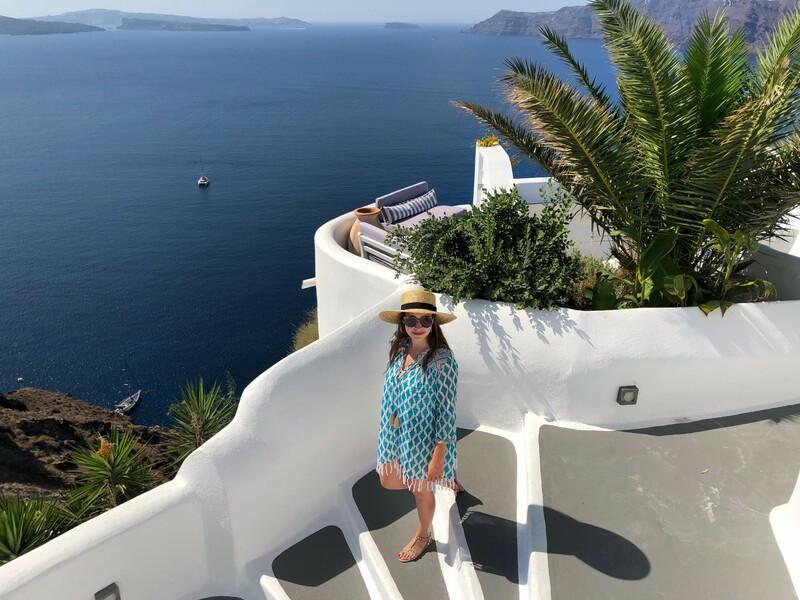 Given Oia’s popularity with vacationers, including many cruise ships, which dock off the island during the day and drop off hundreds of guests, it can be challenging to “get the perfect shot” or know where to go to snap it. It can also be a bit daunting to know what not to miss and the top places to see while you are there. 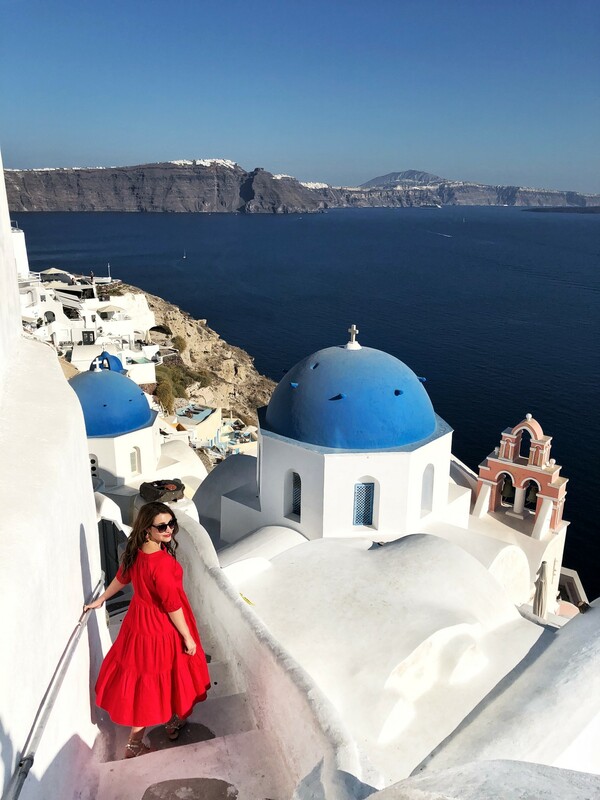 If you’re planning a trip to this beautiful island, I wanted to not only share my favorite photoworthy spots in Santorini, but also a few helpful tips for navigating! 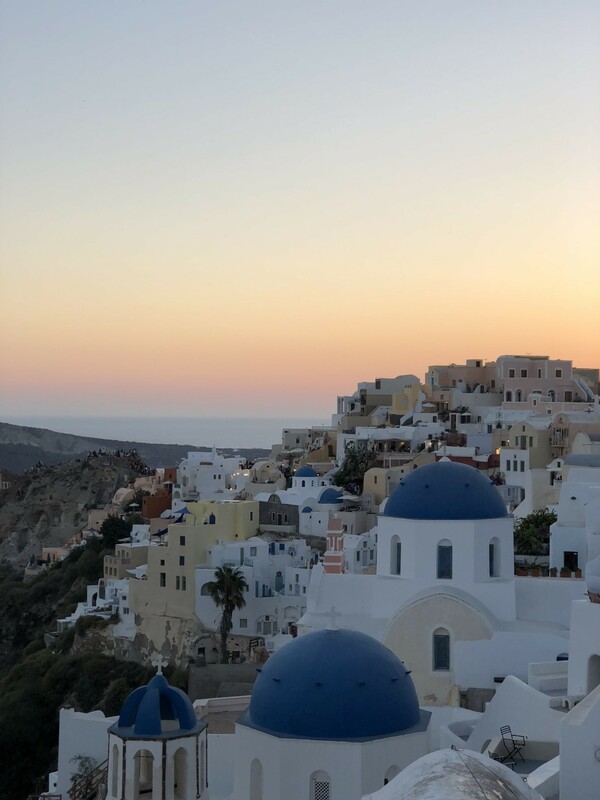 The picturesque blue domes of Oia are one of the first things that come to mind when most people think of Santorini. In actuality, there aren’t as many as you might think, and as you can imagine the domes that do exist are crowded with tourists no matter what time you go. My favorite domes were the two located in the center of Oia. You can capture them from either of their sides and each is equally as beautiful. 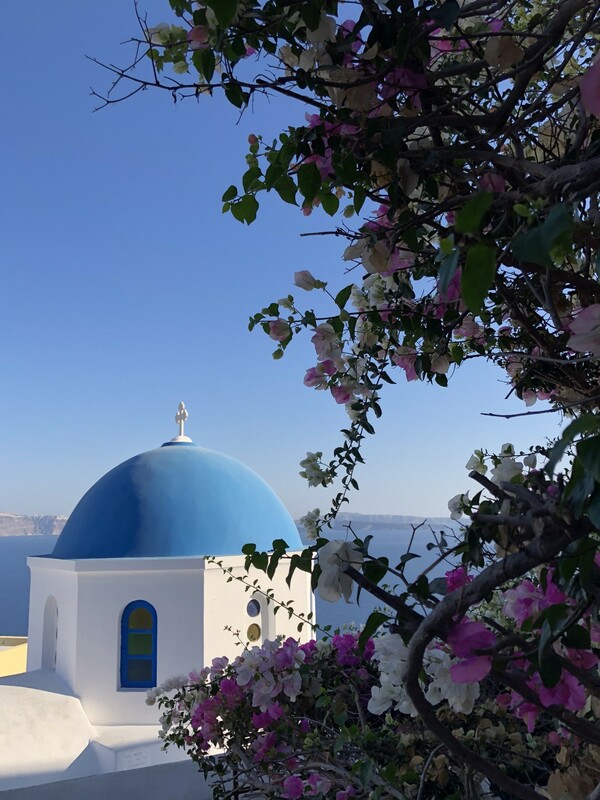 For both photos, you have to walk down a little alley way right past the town center to capture the best shot, but once you are there, it provides an unobstructed view of the domes and white cliffside buildings a.k.a classic Oia. The latter, where you are facing west, is a gorgeous sunset photo! The 300 steps down to Amoudi Bay are steep, but well worth it. I wore the wrong footwear (what else is new?! ), but with assistance from my husband, made it down the rocky pathway to the water’s edge in one piece. 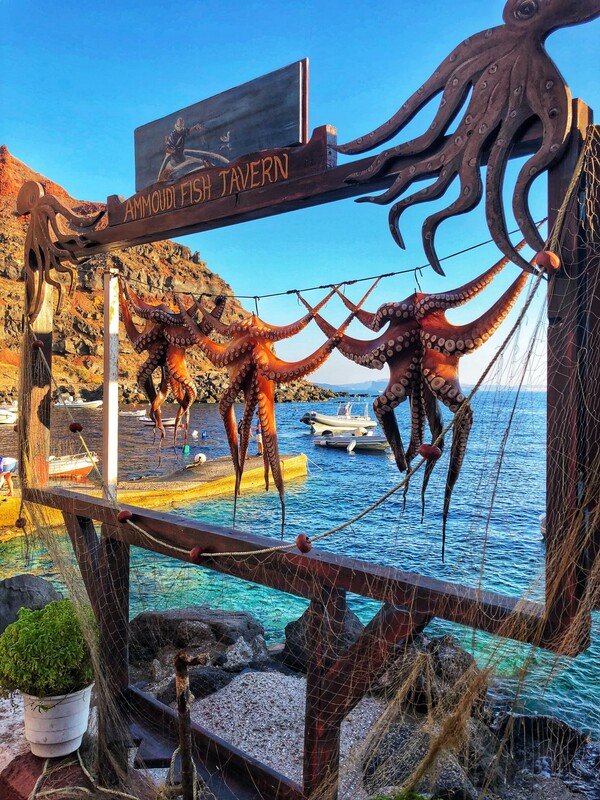 There are only a handful of eateries, all right along the water, and it’s the perfect place to escape the sunset crowds of Oia town. 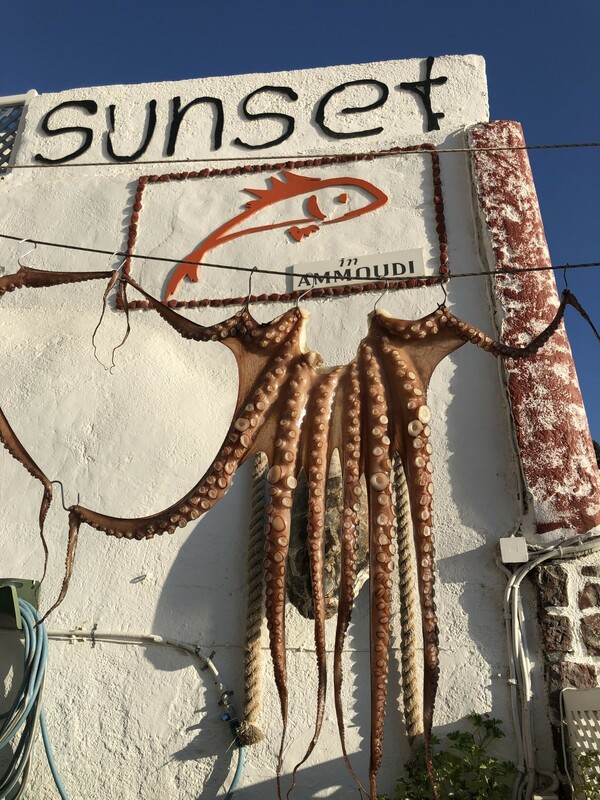 I loved watching the boats and fisherman come in for the day and seeing fresh octopus drying out in the sun. 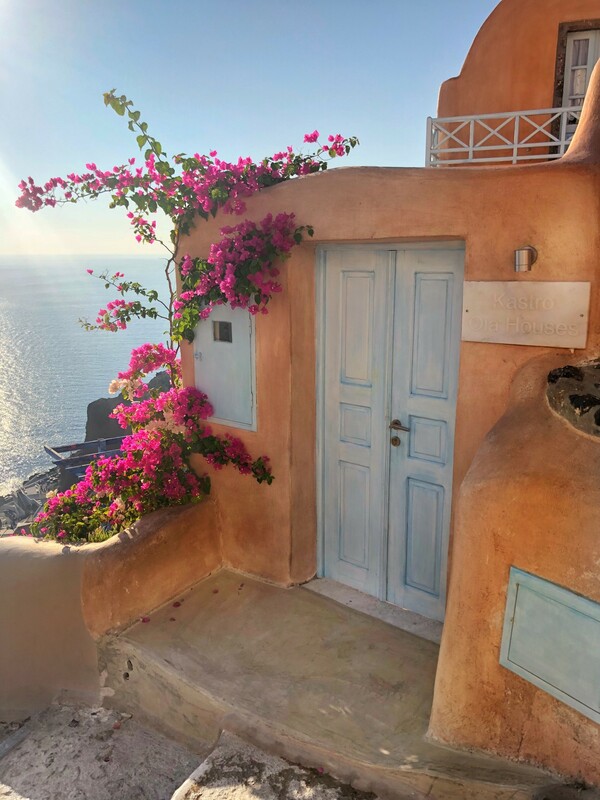 Amoudi Bay feels like a step back in time and is a peaceful retreat from the tourist filled streets 300 steps above you. To return to town, you will experience a post-dinner workout by walking back up, but you could also pay several euros for a donkey ride, or take it easy, and have the restaurant call you a cab. 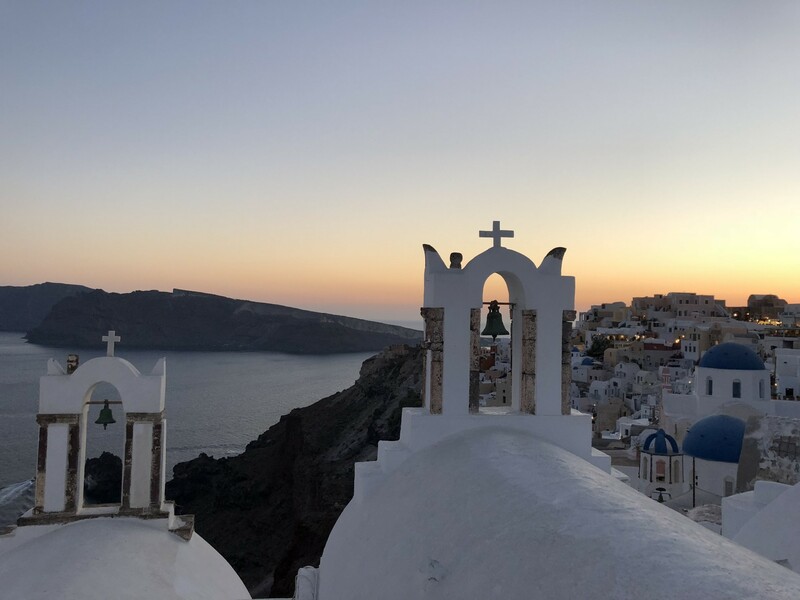 The ruin of a former castle in Oia is the go-to spot to watch the sunset. The crowds start lining up hours before sunset, and without fail, every night, the castle and surrounding area are filled with people. 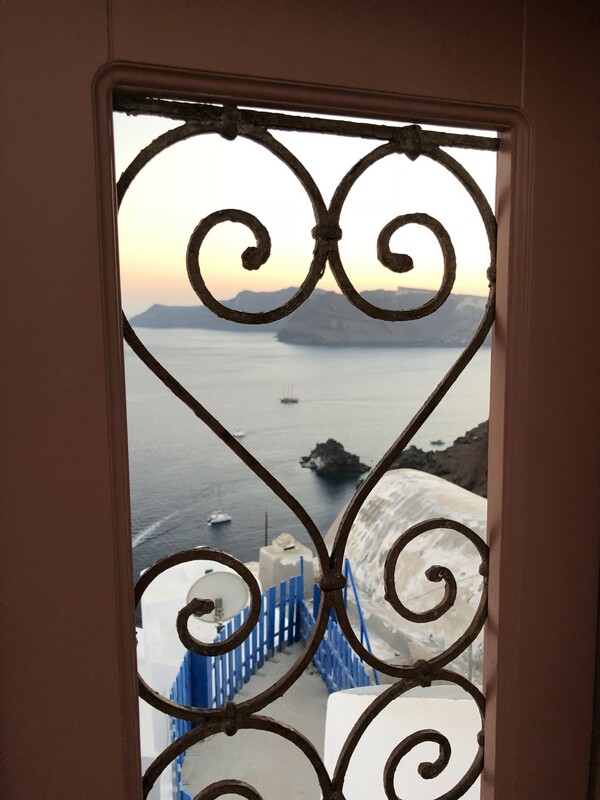 We chose to watch the sunset from afar instead of dealing with the throngs of people (both Pelekanos and Oia Gefsis are restaurants with great views for sunset), but I’d still recommend checking out the castle for gorgeous views and photos. 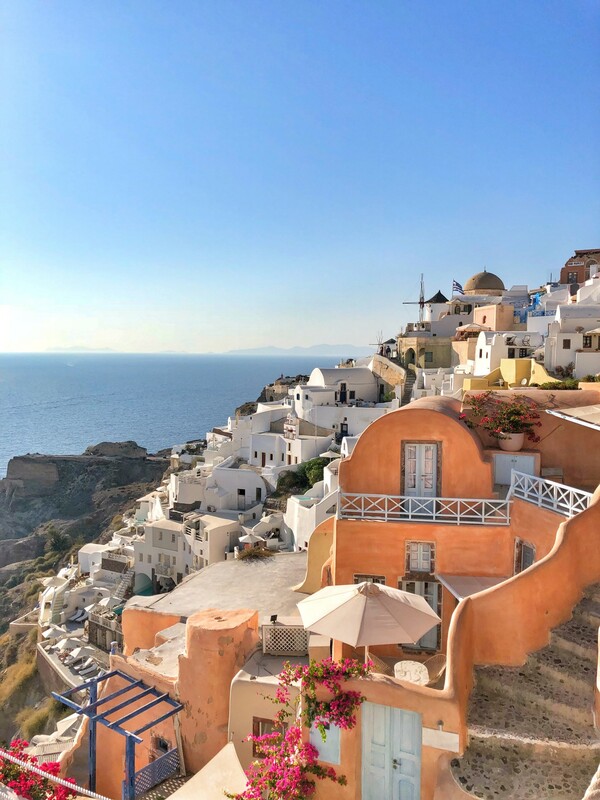 We headed over there mid-afternoon, when the crowds were more manageable, and were able to capture beautiful images of Santorini’s famous peach-colored villa and Oia town with the windmill. 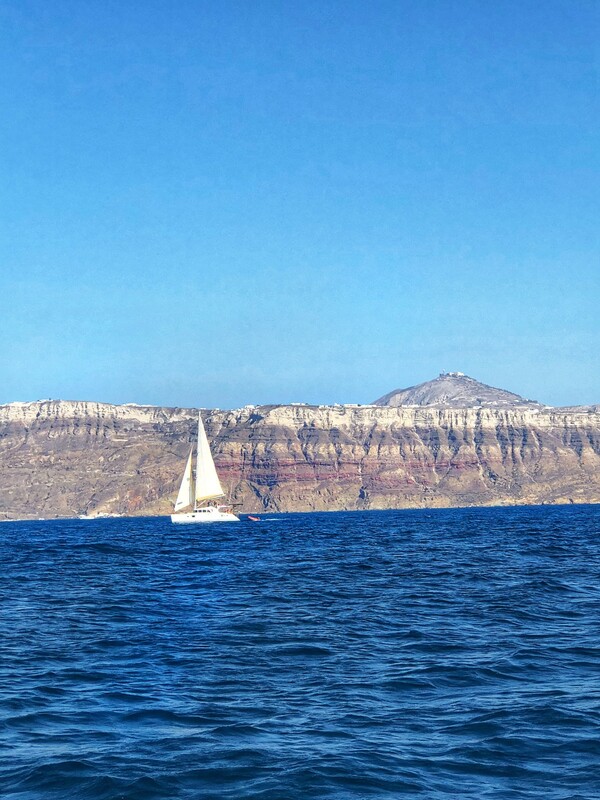 The best activity we did during our time in Santorini was a private boat ride on the Aegean Sea. 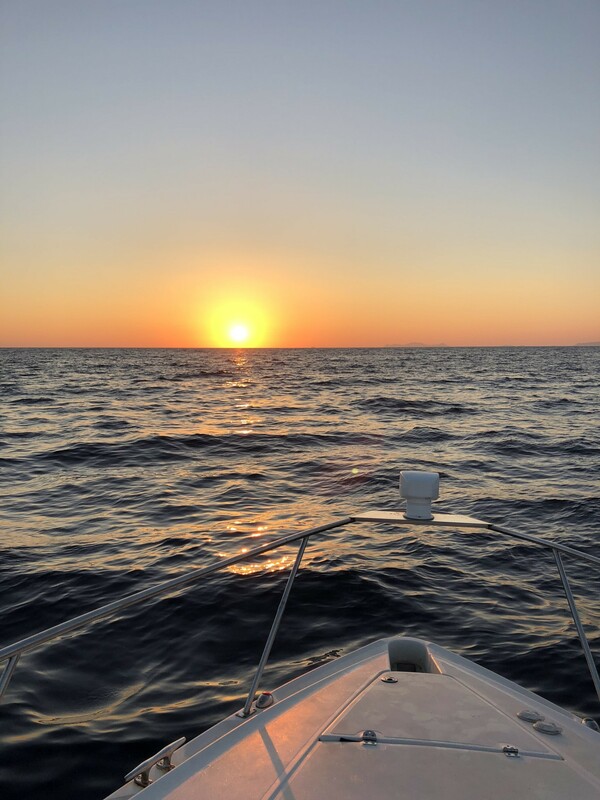 After doing significant research, we decided to forgo taking a traditional sunset catamaran tour, which always have several other couples involved, and instead, hire a skipper with a private yacht. I can not recommend our trip with Panos on the yacht, Alex, enough. 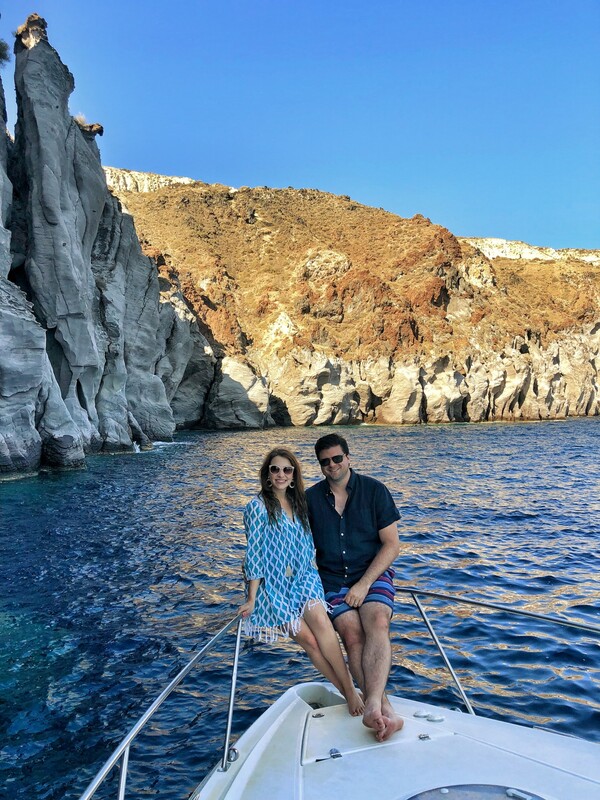 Panos was incredibly knowledgeable about the island and sailed us to more secluded places in the caldera to swim and snorkel before making us a delicious dinner of seven traditional Greek plates. 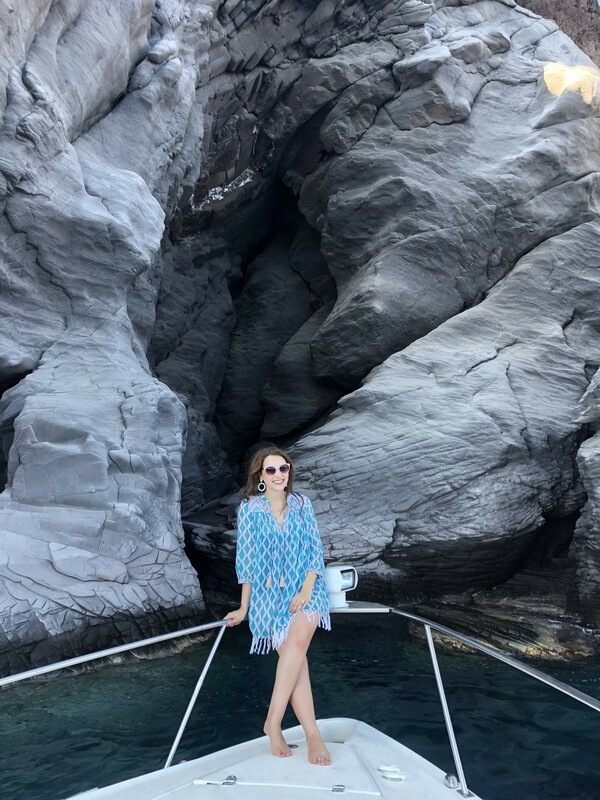 Seeing the caldera and island of Santorini from the water was breathtaking. You can really get a great feel for the vastness of the former volcano and even experience the heat of the sulphur springs by swimming in the center of the caldera. 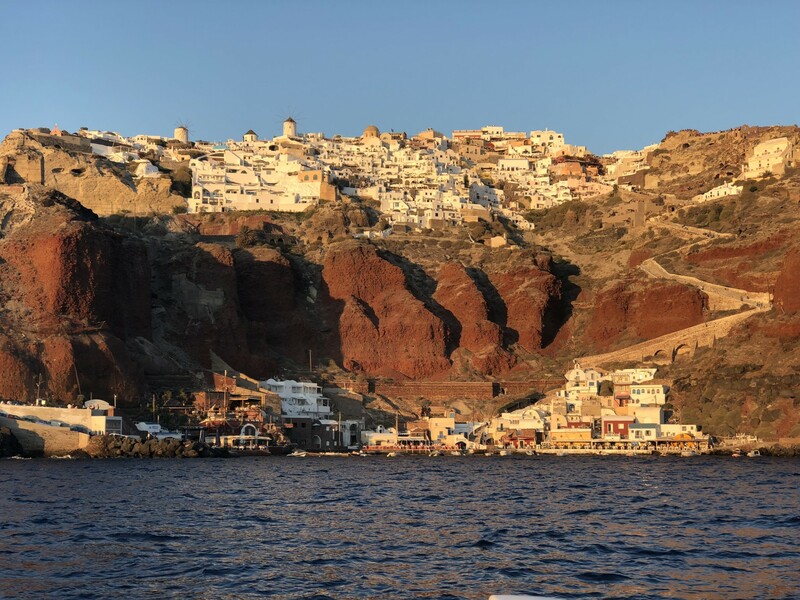 As the sun went down, we were able to embrace the beauty of Santorini from the water. While a private boat was definitely more of a splurge, we both felt it was more than worth it, as the personalized touch and privacy made it that much better! 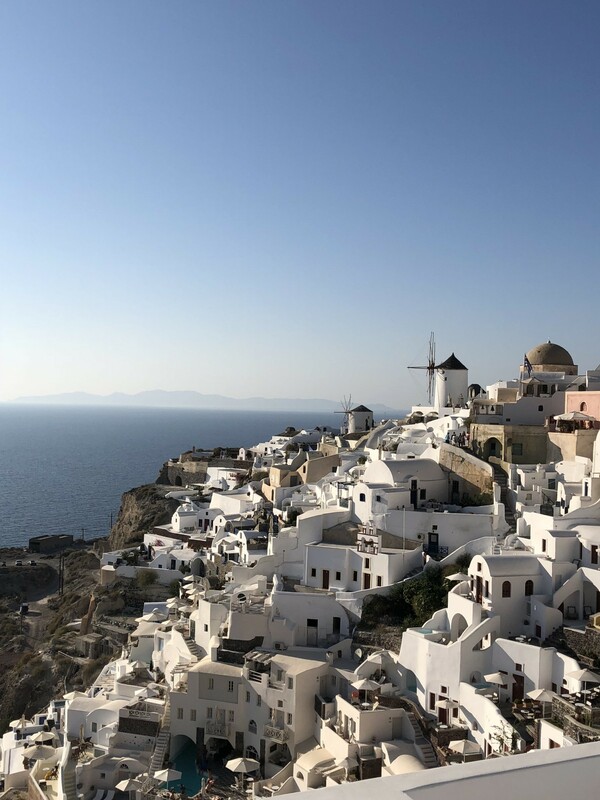 When people think of windmills and Greece, images of the famous Mykonos windmills likely come to mind, but there are actually several windmills right in Oia! On one of our morning walks, we stumbled upon one of the windmills in town and the most perfect little restaurant next to it (Sun Spirit Cocktail Bar would have an amazing sunset view, too!). 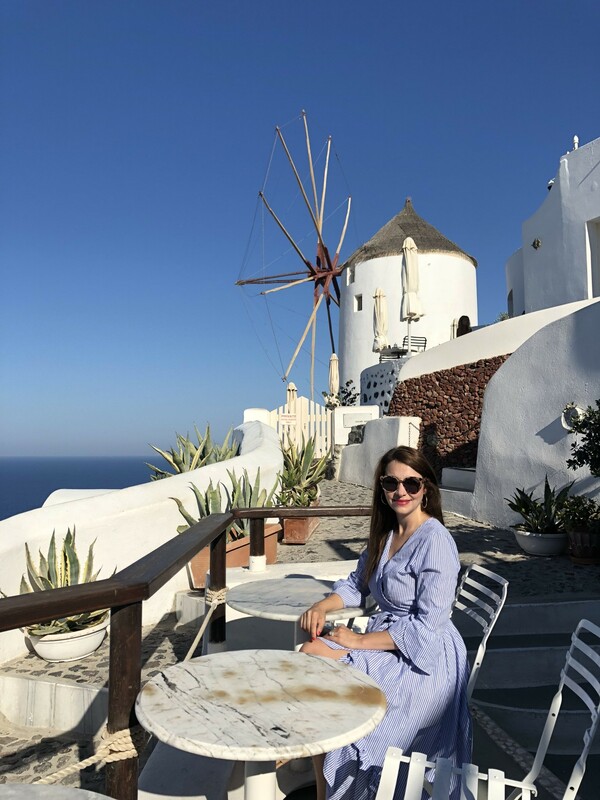 I was in awe of its beauty and the history behind it — it’s likely the windmills in Santorini were built in the 14th century! If you are looking for a less crowded photo opportunity, this was a quieter spot to take in magnificent seaside views. Cabs are very expensive on Santorini, however, there is a public bus system that is easy to use or you can rent an ATV to get around. 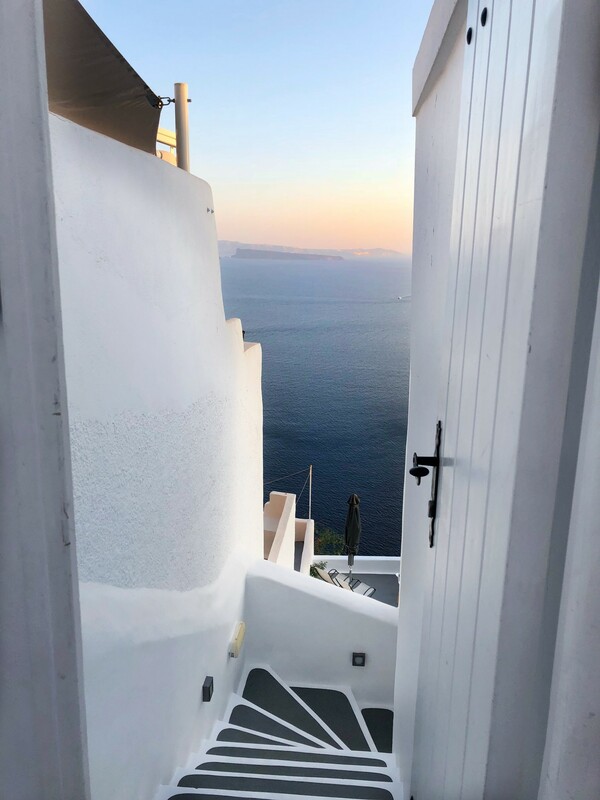 If you stay in Oia, everything is walkable. We spent our days by the pool and nights exploring town, which eliminated our need for a car. If we had more time, I would have liked to have seen more of the island, particularly a few wineries, but all of them were a cab ride away. 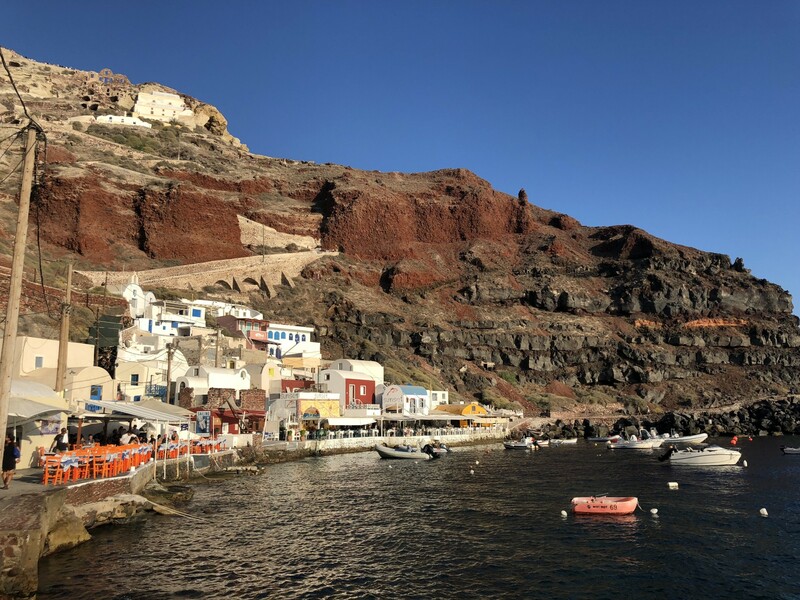 The only other town we visited on Santorini was Fira (when we took our boat ride) and it felt much less romantic and very kitschy compared to Oia. 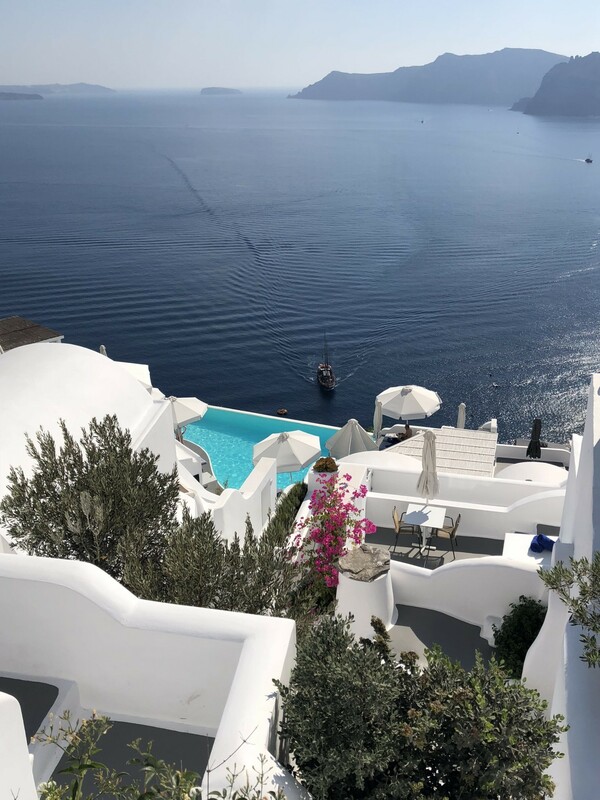 If you want to stay in a gorgeous village that allows you to walk to restaurants and boutiques, but still allows for jaw-dropping views and privacy, I would highly suggest booking your hotel in Oia. 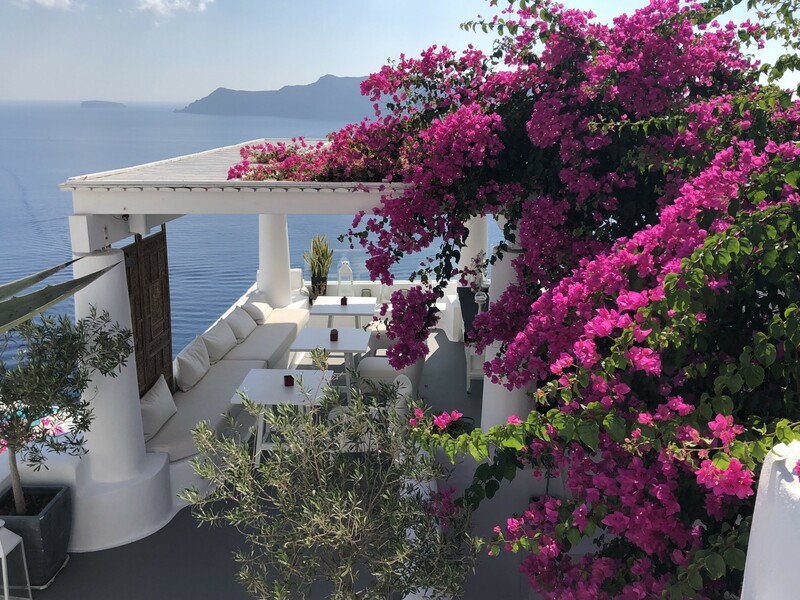 We traveled to Santorini in September and everyone at the restaurants and shops said that it was far less busy than the summer, but in our opinion, it still was packed! I can only imagine how crowded it is during the in-season and would suggest traveling either right before (early May) or right after (mid-September). 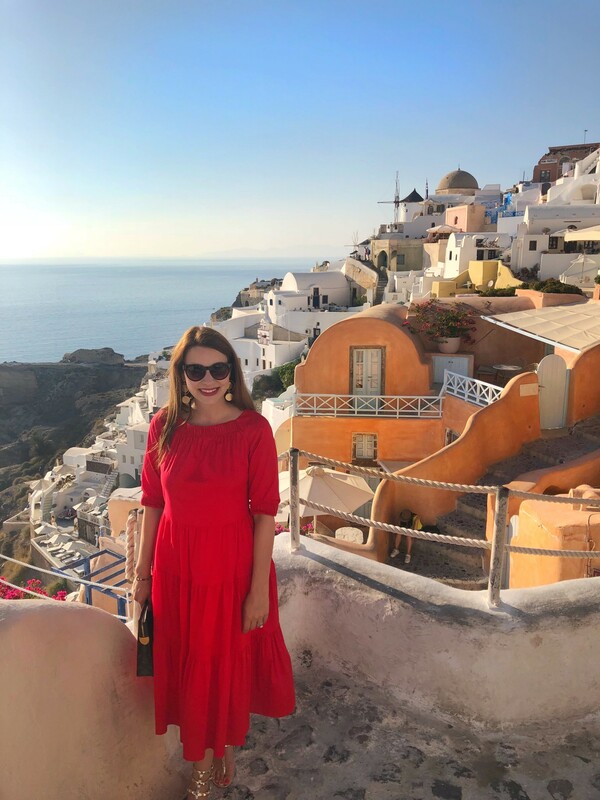 The streets in Oia town are very narrow – one line of people walking in each direction, so you can imagine the bottleneck it becomes when someone stops to look in a shop or talk – it holds up everything! We didn’t book any of our dinner reservations in advance and never had an issue, but if there is a spot you are dying to try, I would recommend reserving your spot ahead of time. 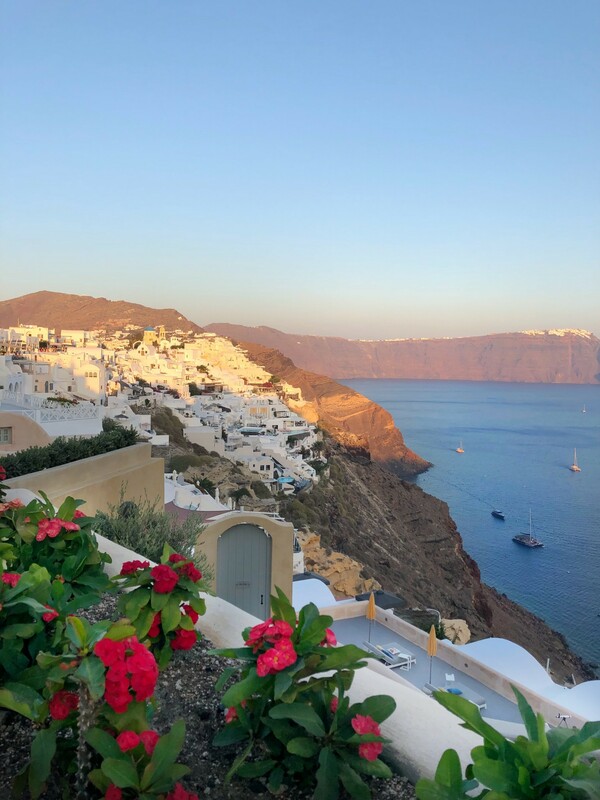 We typically found a place to watch the sunset or have a drink while watching the sunset (Oia Gefsis has a full bar on its rooftop with excellent sunset views) and then opted for a later dinner. For meals, we loved Pelekanos, Roka, and Meletini. If you are heading to Mykonos after Santorini, the most direct way to travel between them is by fast ferry, which roughly takes two hours. We booked our tickets ahead of time on SeaJets and headed to the port around 1 hour before departure. I had heard a lot of negative remarks about the ferries, but overall, I thought they were fairly efficient. A few things to be prepared for: when people begin boarding, you do feel like you are in a herd of cattle (tons of people all trying to funnel onto a small ramp) and you can’t take your large luggage with you, so it remains unattended on the bottom level of the ship. Other than that, it was smooth sailing, as you have assigned seats, there are plenty of bathrooms, and a snack bar with food and drinks.